Education funding reform is long overdue for students with special needs in Ontario. Currently students with special needs receive special education funding only if they attend a public government school. This paper calculates the expenditure required for funding reform for students with special education needs who attend an independent non-government school. Education funding reform is long overdue for students with special needs in Ontario. Currently education funding for students with special education needs is based on the school attended rather than the special needs of the child. Unlike health funding in Ontario which is based on the needs of the student and follows the student into their school regardless of the type of school attended, education funding is based on the type of school the student with special needs attends. Currently students with special needs receive special education funding only if they attend a public government school. Students whose parents choose an independent non-government school for their children with special needs—often because the school more closely aligns with the family’s religious, philosophical or pedagogical convictions—are barred from receiving education funding for their special needs. One in five schools in Ontario is an independent school and 6.4 percent of students in Ontario attend independent schools; currently over 138,000 students attend one of Ontario’s 1,285 independent schools. Just under half of the independent schools are religiously-oriented, the remainder operate with a distinct pedagogical or philosophical orientation. In this paper we calculate the expenditure required for funding reform for students with special education needs who attend an independent non-government school. Adjusting outdated policy to provide greater inclusion and equity is a matter of fundamental fairness for Ontario families. Furthermore, family resilience, so necessary for families caring for societies’ most vulnerable members, increases when children are educated within a supportive school community that aligns with their family’s values. This funding reform will enhance family resilience. These funding reforms are consistent with the good governance priorities of protecting the most vulnerable in our communities and the responsible use of citizens’ tax dollars. Finally, the reforms we propose better respect the inherent dignity of all students with special needs in Ontario. Funding reform is long overdue for students with special needs in Ontario. Fortunately, the necessary—and overdue—reforms align with what good governance, equity, and basic fairness require. Current education funding for Ontario students with special needs depends on the school students attend. Specifically, education funding for students with special needs (also called exceptional students) is only available for students who attend government schools (that is, English public, French public, English Catholic, and French Catholic). Exceptional students who attend non-government schools are not eligible to receive education funding for their special education needs. This unfairly penalizes the most vulnerable in our communities. Students whose families follow their conscience rights in selecting a school for their children that more closely aligns with their religious, pedagogical or philosophical convictions are barred from receiving education funding for their special education needs. Almost one in five schools in Ontario is an independent school.4 Ontario has more students educated in independent schools than any province in Canada. Parents are increasingly turning to the independent school sector for the education of their children. More than half of Ontario independent schools are non-religious schools with unique pedagogical visions while 48 percent have a religious orientation.5 Almost five percent of all independent schools in Ontario are established solely to serve students with special needs, and they enrol about two percent of independent school students. Less than five percent of all independent schools in the province are schools that some might traditionally refer to as elite, university-preparatory schools, and they enrol about 17 percent of the province’s independent school students. Not only do independent schools contribute to the financial well-being of the province, but their graduates, as shown in 2018 research from Cardus, also contribute to the civic and social well-being of the province.10 Growth in the sector suggests parents are increasingly turning to independent schools for the education of their children. Unfair Funding Allocation. Education funding for children with special needs is unfairly allocated. It is based on the type of school the student attends rather than on the need of the child. If a child with special needs attends a government school, that is, a public or Catholic school in Ontario, they receive government funding for equipment and services to help them learn, regardless of their disability. This is known as “accommodation” and, by law, all recognized special needs are covered. By contrast, students with special needs enrolled in a non-government independent school, receive limited funding from the Ministry of Health related to specified health-related disabilities; there is no Ministry of Education funding for students with special needs enrolled in a non-government independent school. For example, while students with special needs in independent schools receive funding (sourced through the Ministry of Health) for nursing services, dietetics, occupational therapy, physiotherapy, articulation (speech), they receive no funding (the source of which would be through the Ministry of Education) for learning disabilities, language impediments, deafness, blindness, physical equipment for learning such as cushions, therapy balls, ball chairs, adaptive equipment, nor do they receive funding for learning technology such as desktop computers, laptops, programs such as Kidspiration, Inspiration, Draft Builder, Kurzwell, etc. This restriction also plays out in the allocation of the Special Education Amount funding, as students in independent schools cannot access equipment and services to support their disability. Indeed, one story we hear from families is that adaptive trays for holding lunch materials such as those used by children with high physical needs are provided (Ministry of Health jurisdiction). However, adaptive trays for holding learning materials (Ministry of Education jurisdiction) are withheld from students whose parents choose to send them to a non-government school. Under the current arrangements, if a student with special needs transfers from a public school to an independent school, they are not permitted to transfer any equipment and services which had been provided, regardless of individualized custom fitting or design. Without even discussing the waste involved in this, this is discrimination based on school choice which disregards the needs of the child. Furthermore, it is commonplace to see children in independent schools sitting next to each other, one student with a speech impediment who is assisted by permitted government funded equipment and services (because the source is Ministry of Health, and thus not school-dependent, but needs-dependent) and the next student with an auditory processing disorder, who is denied necessary equipment and services (because the source is Ministry of Education, where funding is school-dependent and disregards need). This is discrimination based on disability. Parents are forced to choose either a school which shares their educational philosophy or faith perspective (while their child’s disability may go largely untreated or treated in underfunded ways) or a school that does not share their convictions, in order for their child to receive services for their disability. Resilient families. The reasons families choose an independent school for their children vary. The most common reasons cited are quality education, safety, and teacher care. But even more, research has found that parents choose, for example, religiously-oriented schools because of the close co-operation and collaboration with the home.11 This is essential to recognize because family resilience is critical for families caring for and raising children with moderate to complex special needs. Communities of belonging that are frequently experienced in independent schools support family resilience over the long term, which is vital to the well-being of parents and children with special needs. Family resilience is undermined when families are essentially forced to send their children with special needs to government schools that do not match their religious, philosophical or pedagogical convictions, if they must separate their children into multiple schools, simply because of the barriers the current arrangement for special education funding places on the family. Effective and Efficient Schools. In many ways, measured and unmeasured, independent schools are effective. They serve the needs and expectations of families, and this explains the continued growth of the sector. They are financially efficient and even in the five Canadian provinces where independent schools receive partial funding (from 35 to 80 percent of the per pupil allocation for a public-school student), the savings to taxpayers because of independent schools is significant. Certainly, if as this paper proposes, funding for students with special needs who attend nongovernment schools was at even 75 percent of what is allocated for students with special needs who attend government schools, the financial efficiency and savings test would also be met in this sector. Ontario has been steadily increasing its total funding for special needs education in public schools over the last five years. For the 2018/19 school year, the Ontario government has committed to spending approximately $3 billion on special needs education through the Special Education Grant (see Table 1). The Special Education Grant is comprised of six different allocations and provided to schoolboards for funding programs, services, and/or equipment for special needs education (see Table 2).12 The two largest components of the grant are the special education per pupil amount (SEPPA) and the differential special education needs amount (DSENA). The SEPPA provides school boards with foundational funding for special needs education, and it is based on a school board’s total enrolment and differential per-pupil amounts.13 For example, per-pupil amounts to earlier grades are higher in order to direct more funding to early intervention. While the SEPPA provides a baseline level of funding to all school boards, the DSENA provides additional funding to school boards with the recognition that there is variation across school boards in the share of students with special needs, the nature and degree of those needs, and the capabilities of boards to meet student needs.14 The other components of the Special Education Grant include allocations for special equipment, and three other allocations, including one for students who require the assistance of more than two full-time staff. Based on a number of different sources, the share of students receiving funding from the special education grant who have formally versus informally identified needs has varied over time. For example, a 2010 report from Ontario’s Auditor General revealed that, of students receiving special education services, approximately 68 percent were those who are formally identified and only about 32 percent were non-identified.18 In more recent years, the share of funding being received by students not formally identified has increased, possibly reflecting a greater priority for students who have not been formally identified by the province’s process to receive the help they need in a timely manner. According to government figures, in the 2012/13 school year 56 percent of funding went to students who had been formally identified as “exceptional” by an IPRC, while the remaining 44 percent of students receiving special needs funding had not been formally identified.19 By 2014/15, only 52 percent of students receiving special needs educational resources were formally identified as being “exceptional.”20 To be clear, it is not necessarily negative that students who have not been formally identified as being “exceptional” are making up a larger share of students receiving funding. Rather, the broader inclusion of special needs programs and services likely explains some of why the share of the total student body receiving such funding has been rising over time as discussed below. Indeed, it is important to understand how many public-school students are receiving funding from the Special Education Grant in totality. In general, data on this issue appear to be few and far between. One publicly available estimate from the Ontario government for the 2014/15 school year indicated that 17 percent of students were receiving funding from programs or services stemming from the Special Education Grant.21 Another indicator as to the share of Ontario public school students receiving special education funding comes from the public school advocacy group, People for Education.22 The group surveyed Ontario principals in 2018 and found that, on average, 17 percent of students in elementary schools and 27 percent of students in secondary school received special education funding.23 Combining these estimates with forecasts of enrollment for 2018/19, over 20 percent of Ontario public school students were receiving some form of special education support. This means that the per-special needs student funding for the Ontario public school system in 2018/19, based on the approximately $3 billion in special education funding, was $7540.28 per student. Given that these estimates of the share of students receiving special needs funding are the most recent we could find, they serve as the basis for modeling the cost of extending similar funding to independent school students discussed below. Table 3 displays the outcomes of the 75 percent funding scenario. 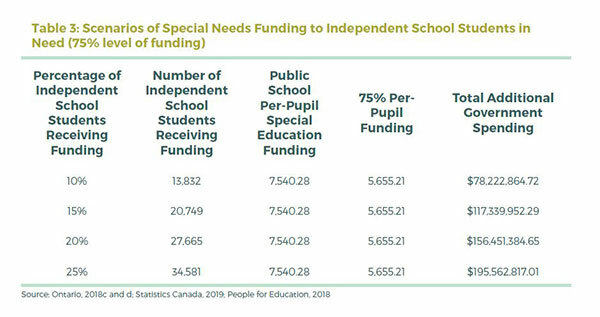 In the enrollment levels utilized below, the additional expenditures from the Ontario government to provide similar special needs funding to independent school students ranges from approximately $78 to $195 million. 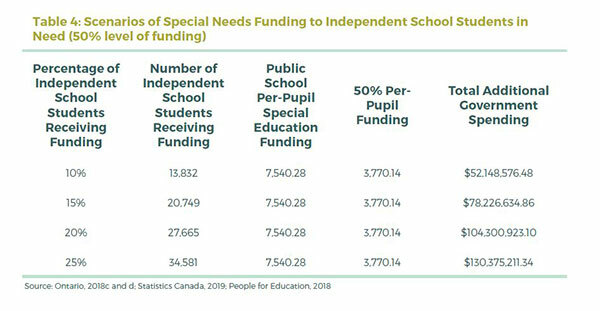 If instead a 50 percent per-public school special needs funding for independent school students is utilized, the additional expenditures for the Ontario government range from $52 to $130 million (see Table 4). Services for a child’s disability should be based on need and not on the school the child attends. This is an issue of fundamental justice in a progressive democracy aligning with recent statements about the inherent dignity of all by the Ontario Human Rights Commission and by the United Nations convention on the rights of persons with disabilities. Implementing the necessary changes would offer protection and respect for the most vulnerable in our society and will lead to enhancing family resilience for those who care for our society’s most vulnerable. Furthermore, the proposal here respects and furthers the responsible use of taxpayer dollars in the service of the public good and inclusiveness. As stated in the Special Education in Ontario Policy and Resource Guide, we believe all students can succeed.28 Each student has a unique pattern for learning. Fairness is not sameness. Providing equitable access to equipment and services to children with special needs in all schools, government and nongovernment (public and independent) will enable all of Ontario’s exceptional children to learn, thrive and succeed. Correcting the long-standing inequity—of school-based rather than need-based funding for students with special needs—will enable this and future governments to uphold their commitments, values and priorities for protecting the most vulnerable in society and for spending public dollars both responsibly and equitably. The change proposed in this brief will be a modest cost for the government, ranging as this paper demonstrates, from $78 million to $195 million if the government provides 75 percent of the funding available to public school students to those students with special needs in independent schools; and $52 million to $130 million if only 50 percent funding is provided. Equitably sharing responsibility for Ontario’s exceptional children in both public and independent schools will empower Ontario’s future, supporting diversity and fairness. This correction is long overdue. Disabilities. Government of Ontario. At: http://www.ohrc.on.ca/sites/default/files/Policy%20on%20accessible%20education%20for%20students%20with%20disabilities_FINAL_EN.pdf. 1) The government has committed to examining spending practices “to identify ways the government could transform programs and services to ensure sustainability and value for money” (Ministry of Finance, 2018b, p. 3). It claims that its actions have already included “making existing government programs more effective” (p. 3) through providing families more choice in at least two program areas (child care and autism). It has “found savings and efficiencies, while giving individuals, families and businesses important tax relief ” (p. 3) and it is taking action “to make programs and services more efficient” (p. 3). 4) The Education Act and government policies typically refer to these schools as “private schools” although in popular nomenclature they are known as “independent schools” because they are owned and operated independent of government agencies. On occasion they are called non-government schools (NGSs). 7) Ontario, Ministry of Education. (2018a). Quick Facts, Ontario Schools, 2015-16. At: http://www.edu.gov.on.ca/eng/general/elemsec/quickfacts/2015_2016.html. 12) This grant can only be used for special education and any unspent funding must be set aside for special education uses in the next school year. Ontario, Ministry of Education. (2018c). 2018-19 Education Funding: A Guide to the Grants for Student Needs. At: http://www.edu.gov.on.ca/eng/funding/1819/GSNGuide2018-19Revised.pdf. 13) There are different per-pupil amounts for grades K-3, 4-8, and 9-12.
with all special needs, including students with mental health and Autism Spectrum Disorder needs. 17) Ibid., People for Education (2018). 18) Almost 10 percent of identified students receiving funding were classified as gifted. Auditor General of Ontario (2010). Chapter 4, Section 4.14: Special Education. At: http://www.auditor.on.ca/en/content/annualreports/arreports/en10/414en10.pdf. 7.14 percent of all students were also receiving special needs educational programs or services. Ontario, Ministry of Education. 21) Nine percent of all Ontario students receiving special education funding were identified as exceptional and eight percent were not. 22) People for Education (2018). 2018 Annual Report on Schools: The New Basics for Public Education. At: https://peopleforeducation. and thus we use it for our first set of calculations. 27) These savings were not included in our estimates given that we cannot say how many students with special needs could transfer to the independent school sector following the funding change.